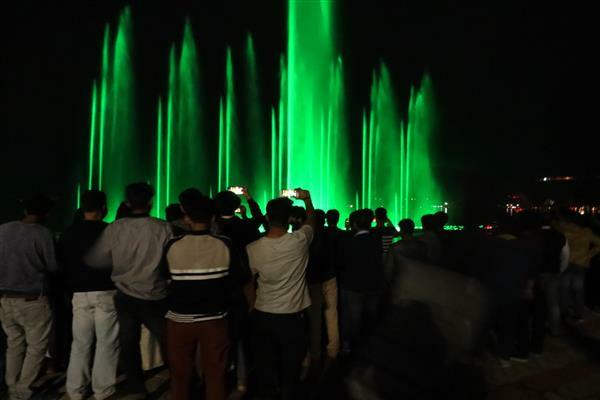 Srinagar: The department of tourism has decided to run musical fountain and laser show in Dal Lake, three times each evening. He said that the facility has been commissioned to make the city life lively and provide entertainment to the locals and also to the tourists. “We have kept no entry fee for first 15 days to allow more people to enjoy the show,” said Samphel. He said SKICC is an important venue of the State government to attract MICE tourism and this additional facility will give a boost to the State’s tourism sector. Pankaj Chedda of Hazel Tours, a leading tour operator from Maharashtra, said there was a lot rush on Friday. “I had to manage my entry with difficulty. This is good news for us and we will sync our itineraries and tour plans for our clients according to the timings of the laser show. This added attraction in Srinagar will definitely help us sell tour packages in a more attractive way,” he said.